King of Poland (1228-79). During his reign (1240) the Mongols under Batu-Khan, the grandson of Genghis Khan, invaded Poland and carried away many thousand Jews as slaves to Asia. His reign is memorable also for the fact that he encouraged the immigration of German artisans into Poland and introduced the Magdeburg law (Jus Teutonicum). This influx of Germans evoked against the Jews the hatred that had already taken root in western Europe during the Crusades. 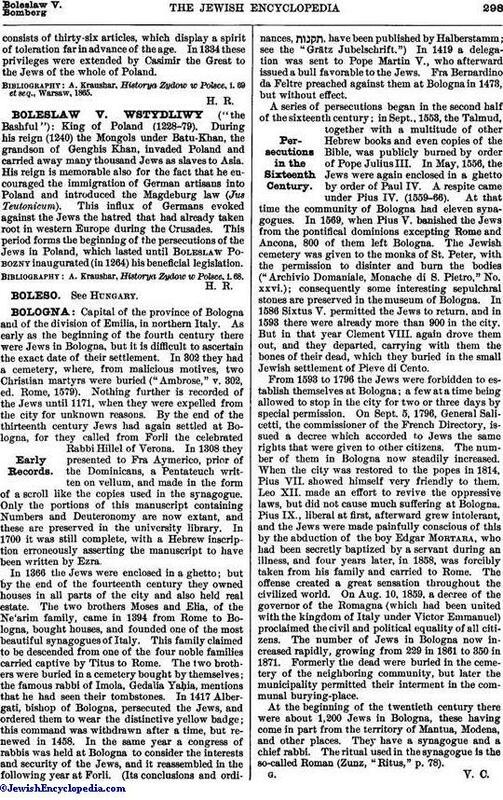 This period forms the beginning of the persecutions of the Jews in Poland, which lasted until Boleslaw Pobozny inaugurated (in 1264) his beneficial legislation. A. Kraushar, Historya Zydow w Polsce, i. 68.